On February 27, Catherine H. Chase will speak on the topics of handling email, social media, and other ESI (Electronically Stored Information) and ethical considerations at the upcoming continuing legal education seminar, The Rules of Evidence: A Practical Toolkit. Brian Quisenberry and Leslie Whitten will be speaking at the upcoming seminar for SC Prima on March 5 and 6 in Greenville, SC. They will speak about overlapping issues in employment and workers’ compensation laws as well as Cybersecurity. To learn more, or to register, go to this link. YCRLAW attorneys Duke Highfield, Joe Tierney, and Billy Sweeny obtained a directed verdict in favor of their client in Horry County, South Carolina, in November of 2017. The plaintiff sued for premises liability and negligence per se, and sought damages alleging permanent and total disability. At no point was a demand ever submitted by plaintiff’s counsel for less than $6,000,000.00. The directed verdict was issued at the close of the plaintiff’s case on the third day of trial that was scheduled to last the week. Wallace “Buster” Holland celebrates his 45th anniversary with YCRLAW this year. Buster started the firm’s Workers’ Compensation group and currently serves exclusively as a mediator for workers’ compensation claims. YCRLAW is tremendously grateful for Buster’s service, and we look forward to his continued work as a mediator. 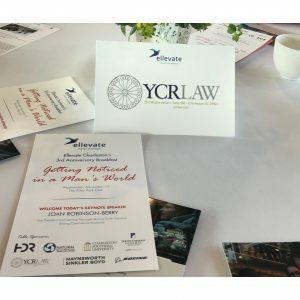 YCRLAW was pleased to sponsor a table of the Charleston Chapter of Ellevate Network’s 3rd Anniversary Breakfast where Joan Robinson-Berry of Boeing South Carolina spoke about knowing the corporate culture, controlling your personal brand, and improving our community. Tori Anderson, Catherine Chase, Carol Ervin, Stephanie Ramia, Joanna Stroud, and Leslie Whitten were able to attend this inspiring event along with some YCRLAW clients. Catherine Chase is also the Co-President of the Charleston Chapter of Ellevate Network. Duke R. Highfield has just celebrated his 25th anniversary with YCRLAW. Duke wears many hats at YCRLAW, including as the chair of four practice groups and chair of the firm’s marketing committee. YCRLAW greatly appreciates Duke’s service, and we look forward to many more successful years to come. YCRLAW was overwhelmed by bears this week thanks to our generous staff and attorneys. Luckily, MUSC Children’s Hospital is helping each bear find a loving home. YCRLAW is honored to announce that the law firm has received a Tier 1 Ranking in the 2018 Edition of U.S. News – Best Lawyers “Best Law Firms”. This Tier 1 ranking was determined from the firm’s overall evaluation, which was derived from a combination of factors including clients feedback and the high regard that lawyers in other firms in the same practice areas have for the firm. 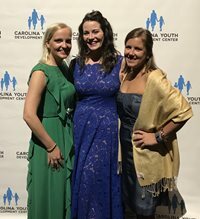 YCRLAW attorneys Tori Anderson, Stephanie Ramia, and Joanna Stroud attended the Carolina Youth Development Center’s 14th Annual “A Night for the Children Gala” on Thursday, October 12 at the Memminger Auditorium. YCRLAW is a proud sponsor of this gala; the proceeds go to residential services for child victims of abuse, abandonment, and neglect. YCRLAW partner C. Michael Branham and special counsel Raymond W. Burroughs have been honored by Charleston Business Magazine as part of the Legal Elite for 2017 in the area of Tax and Estate Planning. This is the inaugural list for the magazine and attorneys receiving this honor were chosen by other area attorneys.